Does it feel safe to get on a motorbike with a woman half my size? No, it does not. 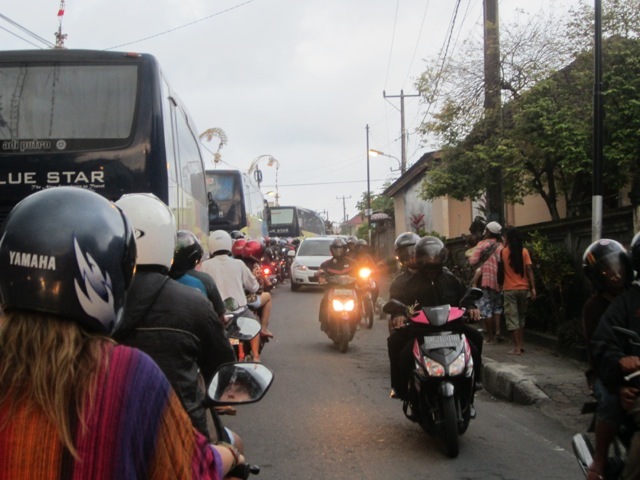 Is it safe to cruise mindlessly down a sidewalk in Bali? No, it is not. But I would find myself engaged in both of these activities while on a quest for an apartment in Ubud, Bali – a gorgeous Indonesian island of international fame. 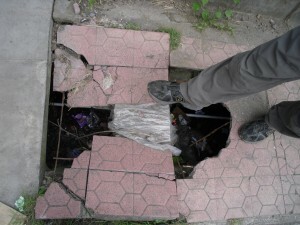 Even the sidewalks are dangerous! We’d been in Ubud for almost a week. The sidewalks here double as lids for the storm drain canals, and every panel provides a potential access point to the abyss below. After nearly plunging six feet through broken or missing panels into horrific muck on several occasions, my awareness has improved to an almost-safe level. Pounding the dangerous pavement for three days, I had failed to generate any housing leads of my own. At one community center, upon being asked to elaborate on what I was looking for and listing bedroom, kitchen, and bathroom, the women behind the desk latched on to my final word and pointed me to the toilets around back. I turned to local couchsurfing hosts for help, was pointed to a Facebook group, and finally landed myself on the back of Putu’s motorbike. Typical traffic - this isn't even crowded! It still feels like you're missing accidents by less than an inch! Putu Sri looks ten years younger than me, but in fact this happy, always-smiling-rental-agent is exactly my age! I sort of knew what I was in for as I strapped on my helmet. Motorbikes in SE Asia don’t seem to believe they are part of “traffic” any more than a horse believes it is part of the barn. As such, traffic laws go unacknowledged by any two-wheeled transport. 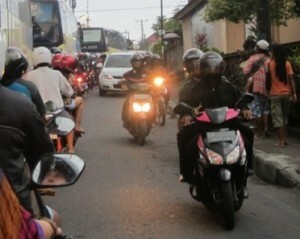 Sure enough, Putu pulled straight into the oncoming traffic headed toward us down the one-way street. I swallowed a shriek and tried not to react with my body. Putu is so small, a stiff breeze could knock her sideways. Any sudden move from my 50 extra pounds, and I was sure we’d become pavement art. Add a helmet and some femininity, and you've got me on the back of Putu's motorbike! She played chicken with every manner of vehicle, while I tried to keep from kneeing her elbows, slamming into her helmet, or kneeing myself in the chin. The foot pegs on this particular scooter were just underneath my fanny, so I was squatting on the bike more than sitting. I tried desperately not to let my airborne knees get caught on passing side mirrors, other bikes, or opened car doors. I assumed a Quasimodo-esque position to lower my center of gravity and squeezed my eyes shut each time she slammed on the brakes and sent the front of my helmet crashing into the back of hers. Afew pictures taken during our house hunting days are here. Photo credit links: motorcycle traffic, scared cartoon guy.